ATLANTA -- Alexander Ovechkin keeps doing it and he keeps making the otherworldly look commonplace. The Washington Capitals' two-time Hart Trophy winner has recorded two-goal games six times already in 12 games. With a League-leading 13 goals, he's on a pace to score almost 90. He also leads the NHL in points with 22. 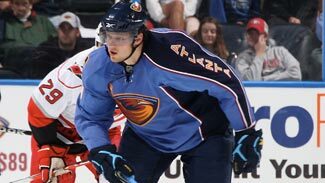 One week after the left wing was held without a point in Atlanta, he returned to the scene of the crime and torched the Thrashers with a 2-goal, 1-assist night in a 4-3 victory Thursday. In his pointless Oct. 22 game, a 5-4 Capitals' victory, Washington's power play went 0-for-7, and coach Bruce Boudreau called it one of the team's worst efforts in that department in his three seasons. Boudreau addressed that topic at Thursday's morning skate. "We've got the potential to be on track, but they just got to do pretty well what I say," he said. "When they start ad-libbing, we get all over the place ... It's frustrating because we believe we know what works and when they listened last year we were pretty good." Ovechkin and his teammates must have listened. Shockingly, Washington entered Thursday ranked 21st in the NHL on the power play at 17.3 percent. But Ovechkin helped them to get healthy. The Capitals were 2-for-5 on the power play, as Ovechkin figured in both goals. In typical fashion, he blasted Mike Green's cross-ice pass past Ondrej Pavelec for a 1-0 lead at 10:03 of the first period on the Capitals' first attempt of the game. Ovechkin then helped Washington to score on their third power-play try with his assist to Brendan Morrison. Morrison, stationed near the goal line on the right side, took the feed from Ovechkin at his familiar spot at the left circle shot the puck in off Pavelec's catching glove. The difference on Thursday, Ovechkin said, was that Washington took advantage of its chances while Atlanta was unable to – with no small thanks to Capitals goalie Semyon Varlamov. "They didn't use their chances, so I think we play great today and keep our team on track," he said of his team's sixth straight win. His second goal came at even strength and made it 2-0. Throughout the game, the Capitals appeared to float one of their skilled forwards high in the neutral zone and Nicklas Backstrom spotted Ovechkin in position for a breakaway. Somehow Atlanta did not have a defenseman back to guard against the League's most dangerous goal scorer and forward Maxim Afinogenov, who fell to team-low minus-6 after the game, was left to try and guard Ovechkin one-on-one. Afinogenov made a desperate dive for Backstrom's long pass, which failed, sending Ovechkin in alone on the defenseless Pavelec, whom Ovechkin beat with a blinding wrist shot. Ovechkin, who leads NHL forwards in time on ice and also in shots with 78 – with 27 more than the two players tied for second – led in those categories again on Thursday. He led Capitals' forwards with 19:23 and took six shots. If Ovechkin had any flaw in his game on Thursday, it was that he was on the ice for Atlanta's second goal, which made it 3-2 and gave Atlanta life with 2:23 left in regulation. Slava Kozlov sprang Todd White on a breakaway, as the Thrashers made it close at the end. After the game, the Capitals engaged in a fair bit of self-criticism about their difficulty in holding leads. Ovechkin would have to be included in that group. "We're good enough and skilled enough to win games regardless of how we play," defenseman Brian Pothier said. "If we want to make the jump from a good team to a great team, that third period is what we need to do." Even Ovechkin didn't seem satisfied despite his herculean efforts. "Yeah, I don't know why but in third period we just have shorthanded goals and they wake up right away," he said. "We just stop playing. I don't know why. It can't be happening right now, especially against a team in our division." Regardless, No. 8's efforts were enough for his team to come out on top again.